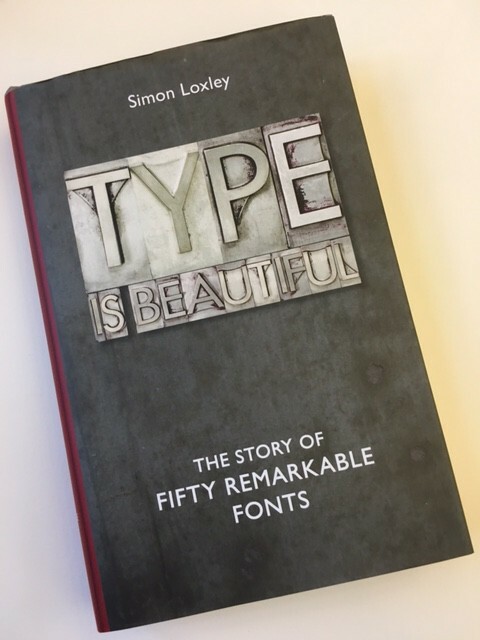 This new book by Simon Loxley ‘Type is Beautiful’ brings together fifty different fonts from Gutenberg (used from around 1454) to Zulia (designed in 2013) and many in between. It starts with a chapter explaining about type design, why we need more than one style, how letter designs are translated into type, the development of different designs for headings and titles, and how type is designed and used today. Simon Loxley’s selected fifty types are not ‘the best of’ but ones that have a significance, and, more often than not, a story. 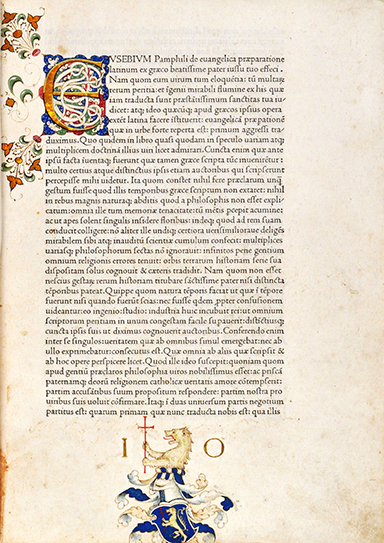 The type used by Gutenberg for the first printing presses in Europe, in Mainz in Germany, was based on Gothic Black Letter manuscripts. 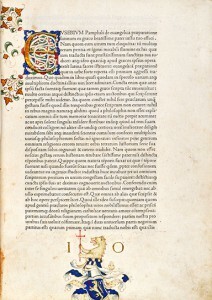 It was a Frenchman, Nicolas Jenson, working in Italy, who produced a Roman type (based on the work of others) that, from the 1470s, lead the way for many years. 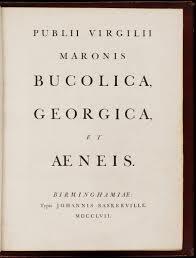 It was not only the type design that was important, but also the type-setting. Unlike modern newspapers, magazines and books the impression on the page on the right is one of clarity and evenness; even though there are right and left justified margins, no lines are denser as the letters have been packed in, nor any lighter as the letters have been stretched out. William Morris was a polymath who, it is said by his biographer, typically spent five years on something achieving a very high standard, and then moved on to something new. When setting up the Kelmscott Press Morris knew that he wanted ‘letters pure in form; severe, without needing excrescences; solid, without the thickening and thinning of the line’. 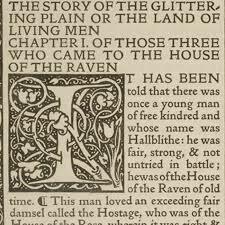 An example of the ‘Golden Type’, designed by Morris and Emery Walker, and first seen in 1891, is in the first book printed at the Kelmscott Press – ‘The Glittering Plain’. 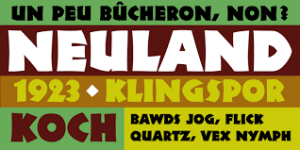 ‘Neuland’, first seen in 1923, is a completely different typeface from those that have gone before. Rudolf Koch from Germany was a great calligrapher as well as type designer, and it was said that ‘All his founts are derived from written hands. They spring into life quite freely’. For Neuland, Koch cut the letters directly on to the punches which is remarkable. It is chunky and has great charm. 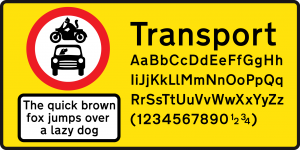 We may pass them every day but road and motorway signs use typefaces and they have to be designed. 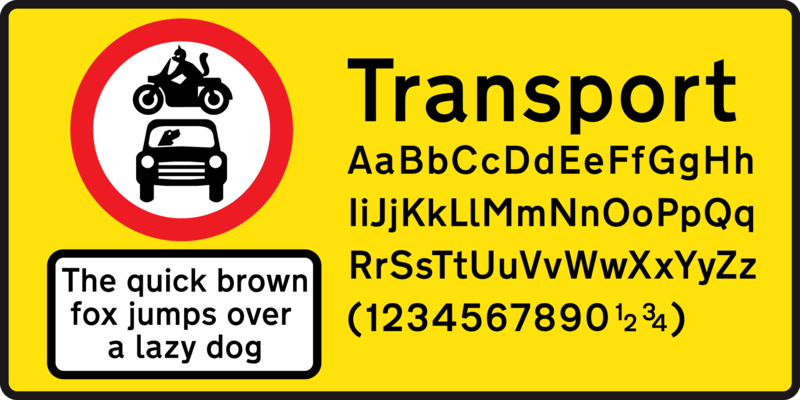 ‘Transport’ is the one used in the UK. It first appeared in 1958 and was designed by Jock Kinneir from Britain and Margaret Calvert from South Africa. The design for such signs needed to be clear and easy-to-read particularly from a distance. When travelling at speed confusion between letter-forms can be dangerous! We are used to brand recognition by company logos, but NatWest bank went one further by commissioning British type-designers Freda Sack and David Quay to create a typeface especially for them. Initially asked to design a one-weight headline for the bank, it was then used for more than that. ‘Natwest’ was said to be one of the first identities that was type-led, and although literature from most banks may not be easily recognisable, because of this typeface, that of NatWest is. This is a fascinating book giving the background to fifty different type designs from the classic to the fun, and it even includes Comic Sans – the Marmite of typefaces! *NB The illustrations used here are not necessarily the ones in the book, as these weren’t available at the time of writing this blog. This entry was posted in Blog, Lettering, lettering and tagged Bodleian Library, Comic Sans, David Quay, Emery Walker, fonts, Freda Sack, Golden Type, Jock Kinneir, John Baskerville, Kelmscott Press, Margaret Calvert, Neuland, Nicolas Jenson, Rudolf Koch, Simon Loxley, The Glittering Plain, Transport typeface, type design, Type is Beautiful, typefaces, William Morris on 15 August 2016 by Patricia.